The Americas, or America, also known as the Western Hemisphere and the New World, comprise the totality of territories in North America and South America. Along with their associated islands, they cover 8.3% of the Earth's total surface area and 28.4% of its land area. The topography is dominated by the American Cordillera, a long chain of mountains that run the length of the west coast. The flatter eastern side of the Americas is dominated by large river basins, such as the Amazon, Mississippi, and La Plata. Since the Americas extend 14,000 km (8,700 mi) from north to south, the climate and ecology vary widely, from the arctic tundra of Northern Canada, Greenland, and Alaska, to the tropical rain forests in Central America and South America. The first known European settlement in the Americas was by the Norse explorer Leif Ericson. However the colonization never became permanent and was later abandoned. The voyages of Christopher Columbus from 1492 to 1502 resulted in permanent contact with European (and subsequently, other Old World) powers, which led to the Columbian exchange. Diseases introduced from Europe and Africa devastated the indigenous peoples, and the European powers colonized the Americas. Mass emigration from Europe, including large numbers of indentured servants, and forced immigration of African slaves largely replaced the indigenous peoples. Decolonization of the Americas began with the American Revolution in 1776 and Haitian Revolution in 1791. Currently, almost all of the population of the Americas resides in independent countries; however, the legacy of the colonization and settlement by Europeans is that the Americas share many common cultural traits, most notably Christianity and the use of Indo-European languages; primarily Spanish, English, Portuguese, French and to a lesser extent, Dutch. The population is approaching 1 billion, with over 65% of them living in one of the three most populous countries (the United States, Brazil, and Mexico). The most populous cities are São Paulo, Mexico City, New York City, Buenos Aires and Los Angeles. The first inhabitants migrated into the Americas from Asia. Habitation sites are known in Alaska and the Yukon from at least 20 000 years ago, with suggested ages of up to 40,000 years. Beyond that, the specifics of the Paleo-Indian migration to and throughout the Americas, including the dates and routes traveled, are subject to ongoing research and discussion. Widespread habitation of the Americas occurred during the late glacial maximum, from 16,000 to 13,000 years ago. The traditional theory has been that these early migrants moved into the Beringia land bridge between eastern Siberia and present-day Alaska around 40,000–17,000 years ago, when sea levels were significantly lowered due to the Quaternary glaciation. These people are believed to have followed herds of now-extinct pleistocene megafauna along ice-free corridors that stretched between the Laurentide and Cordilleran ice sheets. Another route proposed is that, either on foot or using primitive boats, they migrated down the Pacific coast to South America. Evidence of the latter would since have been covered by a sea level rise of hundreds of meters following the last ice age. Both routes may have been taken, although the genetic evidences suggests a single founding population. The micro-satellite diversity and distributions specific to South American Indigenous people indicates that certain populations have been isolated since the initial colonization of the region. A second migration occurred after the initial peopling of the Americas; Na Dene speakers found predominantly in North American groups at varying genetic rates with the highest frequency found among the Athabaskans at 42% derive from this second wave; Linguists and biologists have reached a similar conclusion based on analysis of Amerindian language groups and ABO blood group system distributions. Then the people of the Arctic small tool tradition a broad cultural entity that developed along the Alaska Peninsula, around Bristol Bay, and on the eastern shores of the Bering Strait around 2,500 BCE (4,500 years ago) moved into North America. The Arctic small tool tradition, a Paleo-Eskimo culture branched off into two cultural variants, including the Pre-Dorset, and the Independence traditions of Greenland. The decedents of the Pre-Dorset cultural group, the Dorset culture was displaced by the final migrants from the Bering sea coast line the ancestors of modern Inuit, the Thule people by 1000 Common Era (CE). Around the same time as the Inuit migrated into Greenland, Viking settlers began arriving in Greenland in 982 and Vinland shortly thereafter, establishing a settlement at L'Anse aux Meadows, near the northernmost tip of Newfoundland. The Viking settlers quickly abandoned Vinland, and disappeared from Greenland by 1500. The earliest known use of the name America dates to April 25, 1507, where it was applied to what is now known as South America. It appears on a small globe map with twelve time zones, together with the largest wall map made to date, both created by the German cartographer Martin Waldseemüller in Saint-Dié-des-Vosges in France. These were the first maps to show the Americas as a land mass separate from Asia. An accompanying book, Cosmographiae Introductio, anonymous but apparently written by Waldseemüller's collaborator Matthias Ringmann, states, "I do not see what right any one would have to object to calling this part [that is, the South American mainland], after Americus who discovered it and who is a man of intelligence, Amerigen, that is, the Land of Americus, or America: since both Europa and Asia got their names from women". Americus Vespucius is the Latinized version of the Florentine explorer Amerigo Vespucci's name, and America is the feminine form of Americus. Amerigo itself is an Italian form of the medieval Latin Emericus (see also Saint Emeric of Hungary), which like the German form Heinrich (in English, Henry) derives from the Old High German name Haimirich. Vespucci was apparently unaware of the use of his name to refer to the new landmass, as Waldseemüller's maps did not reach Spain until a few years after his death. Ringmann may have been misled into crediting Vespucci by the widely published Soderini Letter, a sensationalized version of one of Vespucci's actual letters reporting on the mapping of the South American coast, which glamorized his discoveries and implied that he had recognized that South America was a continent separate from Asia; in fact, it is not known what Vespucci believed on this count, and he may have died believing, like Columbus, that he had reached the East Indies in Asia rather than a new continent. Spain officially refused to accept the name America for two centuries, saying that Columbus should get credit, and Waldseemüller's later maps, after Ringmann's death, did not include it; however, usage was established when Gerardus Mercator applied the name to the entire New World in his 1538 world map. Acceptance may have been aided by the "natural poetic counterpart" that the name America made with Asia, Africa, and Europa. An alternative etymology is that it is named after Richard Amerike who was the principal owner and sponsor of the Matthew, a ship that was used in a 1497 exploration of North America. The ranges with the highest peaks are the Andes and Rocky Mountain ranges. Although high peaks exist in the Sierra Nevada and the Cascade Range, on average there are not as many reaching a height greater than 14,000 feet (4,300 m). In North America, the greatest number of fourteeners are in the United States, and more specifically in the U.S. state of Colorado. The highest peaks of the Americas are located in the Andes, with Aconcagua of Argentina being the highest; in North America Denali (Mount McKinley) in the U.S. state of Alaska is the tallest. The climate of the Americas varies significantly from region to region. Tropical rainforest climate occurs in the latitudes of the Amazon, American cloud forests, Florida and Darien Gap. In the Rocky Mountains and Andes, a similar climate is observed. Often the higher altitudes of these mountains are snow-capped. São Paulo – Largest city proper in the Americas with a population of 10,886,534 in 2010. 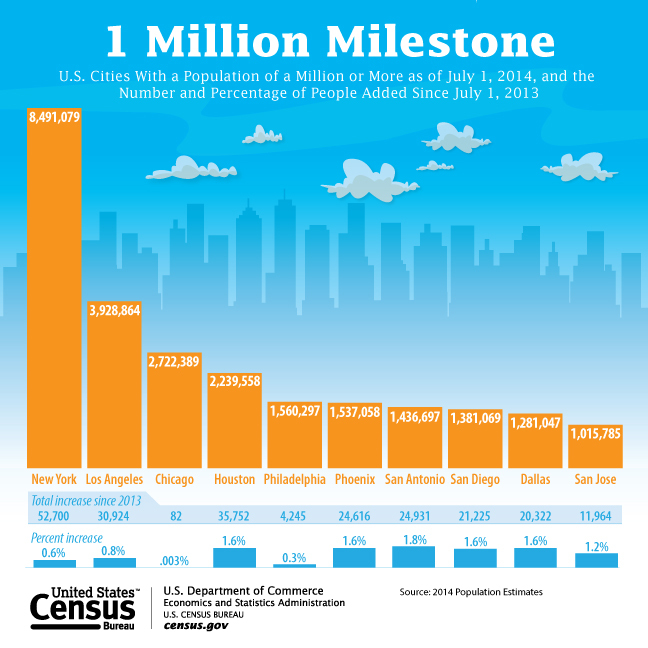 New York City – Largest urban area in the Americas with a population of 18,351,295 in 2010. Mexico City – Largest metropolitan area in the Americas with a population of 20,116,842 in 2010. Buenos Aires - Fourth largest metropolitan area in the Americas, with a population of 15,024,000 in 2014. Those of European ancestry, mainly Spanish, British and Irish, Portuguese, Italian, French, Polish, German, Dutch, Russians and Scandinavians. Protestantism: Practiced mostly in the United States, where half of the population are Protestant, and Canada, with slightly more than a quarter of the population; there is a growing contingent of Evangelical and Pentecostal movements in predominantly Catholic Latin America. Eastern Orthodoxy: Found mostly in the United States (1 percent)and Canada; this Christian group is growing faster than many other Christian groups in Canada and now represents roughly 3 percent of the Canadian population. The most widely spoken language in the Americas is Spanish. The dominant language of Latin America is Spanish, though the most populous nation in Latin America, Brazil, speaks Portuguese. Small enclaves of French-, Dutch- and English-speaking regions also exist in Latin America, notably in French Guiana, Suriname, and Belize and Guyana respectively, and Haitian Creole, of French origin, is dominant in the nation of Haiti. Native languages are more prominent in Latin America than in Anglo-America, with Nahuatl, Quechua, Aymara and Guaraní as the most common. Various other native languages are spoken with less frequency across both Anglo-America and Latin America. Creole languages other than Haitian Creole are also spoken in parts of Latin America. The dominant language of Anglo-America is English. French is also official in Canada, where it is the predominant language in Quebec and an official language in New Brunswick along with English. It is also an important language in Louisiana, and in parts of New Hampshire, Maine, and Vermont. Spanish has kept an ongoing presence in the Southwestern United States, which formed part of the Viceroyalty of New Spain, especially in California and New Mexico, where a distinct variety of Spanish spoken since the 17th century has survived. It has more recently become widely spoken in other parts of the United States due to heavy immigration from Latin America. High levels of immigration in general have brought great linguistic diversity to Anglo-America, with over 300 languages known to be spoken in the United States alone, but most languages are spoken only in small enclaves and by relatively small immigrant groups. The nations of Guyana, Suriname, and Belize are generally considered[by whom?] not to fall into either Anglo-America or Latin America due to lingual differences with Latin America, geographic differences with Anglo-America, and cultural and historical differences with both regions; English is the primary language of Guyana and Belize, and Dutch is the official and written language of Suriname. Most of the non-native languages have, to different degrees, evolved differently from the mother country, but are usually still mutually intelligible. Some have combined, however, which has even resulted in completely new languages, such as Papiamento, which is a combination of Portuguese, Spanish, Dutch (representing the respective colonizers), native Arawak, various African languages, and, more recently English. The lingua franca Portuñol, a mixture of Portuguese and Spanish, is spoken in the border regions of Brazil and neighboring Spanish-speaking countries. More specifically, Riverense Portuñol is spoken by around 100,000 people in the border regions of Brazil and Uruguay. Due to immigration, there are many communities where other languages are spoken from all parts of the world, especially in the United States, Brazil, Argentina, Canada, Chile, Costa Rica and Uruguay—very important destinations for immigrants. Speakers of English generally refer to the landmasses of North America and South America as the Americas, the Western Hemisphere, or the New World. The adjective American may be used to indicate something pertains to the Americas, but this term is primarily used in English to indicate something pertaining to the United States. Some non-ambiguous alternatives exist, such as the adjective Pan-American, or New Worlder as a demonym for a resident of the Americas. Use of America in the hemispherical sense is sometimes retained, or can occur when translated from other languages. For example, the Association of National Olympic Committees (ANOC) in Paris maintains a single continental association for "America", represented by one of the five Olympic rings. The English-language use of American as the demonym for citizens of the United States has caused offense to some from Latin America who may identify themselves as Americans and feel that using the term solely for the United States misappropriates it. To avoid this usage, they prefer constructed terms in their languages derived from "United States" or even "North America". In Canada, its southern neighbor is often referred to as "the United States", "the U.S.A.", or (informally) "the States", while U.S. citizens are generally referred to as Americans. Most Canadians resent being referred to as Americans, but some are said to have protested against the use of American as a national demonym. In Spanish, América is a single continent composed of the subcontinents of Sudamérica and Norteamérica, the land bridge of Centroamérica, and the islands of the Antillas. Americano or americana in Spanish refers to a person from América in a similar way that europeo or europea refers to a person from Europa. The terms sudamericano/a, centroamericano/a, antillano/a and norteamericano/a can be used to more specifically refer to the location where a person may live. Citizens of the United States of America are normally referred to by the term estadounidense (rough literal translation: "United Statesian") instead of americano or americana which is discouraged, and the country's name itself is officially translated as Estados Unidos de América (United States of America), commonly abbreviated as Estados Unidos. Also, the term norteamericano (North American) may refer to a citizen of the United States. This term is primarily used to refer to citizens of the United States, and less commonly to those of other North American countries. In Dutch, the word Amerika mostly refers to the United States. Although the United States is equally often referred to as de Verenigde Staten or de VS, Amerika relatively rarely refers to the Americas, but it is the only commonly used Dutch word for the Americas. This often leads to ambiguity; and to stress that something concerns the Americas as a whole, Dutch uses a combination, namely Noord- en Zuid-Amerika (North and South America). ↑ See List of countries by population for references. ↑ See for example: america – Definition from the Merriam-Webster Online Dictionary. Retrieved on January 27, 2008; "dictionary.reference.com america". Dictionary.com. The American Heritage Dictionary of the English Language, Fourth Edition. Houghton Mifflin Company, 2004. Accessed: January 27, 2008. ↑ 7.0 7.1 "America." The Oxford Companion to the English Language (ISBN 0-19-214183-X). McArthur, Tom, ed., 1992. New York: Oxford University Press, p. 33: "[16c: from the feminine of Americus, the Latinized first name of the explorer Amerigo Vespucci (1454–1512). The name America first appeared on a map in 1507 by the German cartographer Martin Waldseemüller, referring to the area now called Brazil]. Since the 16c, a name of the western hemisphere, often in the plural Americas and more or less synonymous with the New World. Since the 18c, a name of the United States of America. The second sense is now primary in English: ... However, the term is open to uncertainties: ..."
↑ "Western Hemisphere", Merriam-Webster's Geographical Dictionary (3rd ed. ), Springfield, MA: Merriam-Webster, 2001, p. 1294, The part of the Earth comprising North and South America and surrounding waters; longitudes 20°W and 160°E are often considered its boundaries <templatestyles src="Module:Citation/CS1/styles.css"></templatestyles>. ↑ "continent n. 5. a." (1989) Oxford English Dictionary, 2nd edition. Oxford University Press ; "continent1 n." (2006) The Concise Oxford English Dictionary, 11th edition revised. (Ed.) Catherine Soanes and Angus Stevenson. Oxford University Press; "continent1 n." (2005) The New Oxford American Dictionary, 2nd edition. (Ed.) Erin McKean. Oxford University Press; "continent [2, n] 4 a" (1996) Webster's Third New International Dictionary, Unabridged. ProQuest Information and Learning ; "continent" (2007) Encyclopædia Britannica. Retrieved January 14, 2007, from Encyclopædia Britannica Online. ↑ Juan Bialet Massé en su informe sobre "El estado de las clases obreras en el interior del país"
↑ Etnicidad y ciudadanía en América Latina. ↑ Burchfield, R. W. 2004. Fowler's Modern English Usage. (ISBN 0-19-861021-1) Oxford, UK: Oxford University Press; p. 48. ↑ 121.0 121.1 121.2 121.3 121.4 "America." Oxford Guide to Canadian English Usage. (ISBN 0-19-541619-8) Fee, Margery and McAlpine, J., ed., 1997. Toronto: Oxford University Press; p. 36. ↑ Reader's Digest Oxford Complete Wordfinder. 1993. (ISBN 0-276-42101-9) New York, USA: Reader's Digest Association; p. 45. ↑ The Olympic symbols. International Olympic Committee. 2002. Lausanne: Olympic Museum and Studies Centre. The five rings of the Olympic flag represent the five inhabited, participating continents: (Africa, America, Asia, Europe, and Oceania[dead link]). ↑ "America." Microsoft Encarta Dictionary. 2007. Microsoft. Archived October 31, 2009. ↑ "American." The Oxford Companion to the English Language (ISBN 0-19-214183-X); McArthur, Tom, ed., 1992. New York: Oxford University Press, p. 35. This page was last modified on 10 January 2016, at 05:42.